This salad is the perfect solution for the very short time of the year when the ‘seasons’ of rhubarb and picnics and barbecues overlap. Since I’m slightly obsessed with rhubarb this time frame must not be allowed to pass unused! As we all know, the ‘problem’ with rhubarb is that is sour – very sour. The most common solution is therefore to add lots of sugar and turn it into a compote or jam and to use it in baking (ok, granted: the sour-sweet combination is a nice one). Since I don’t eat sugar, I recommend using a good quality stevia product or rice malt syrup. You can still enjoy your rhubarb, but without the side effects. 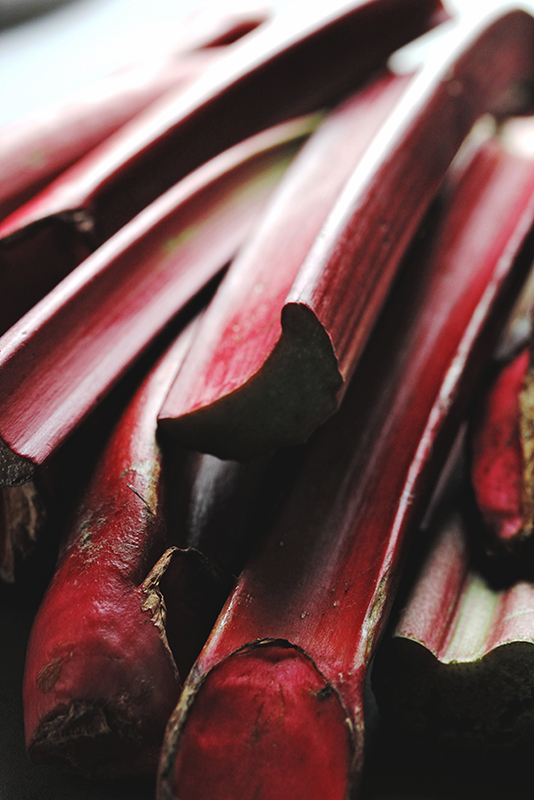 On the contrary rhubarb itself is very rich in fiber, which is great for your digestion and is also a good source of vitamin C. To prolong the rhubarb season, I’m currently ‘working’ – or rather the bacteria are – on a little rhubarb fermentation project with no sweetener at all. I’ll keep you posted. Although rhubarb is actually a vegetable, at least in Germany it is not very common to use it in savoury dishes. Which is a shame since it is so incredible versatile. So if you are bored of rhubarb compote over and over again and want to cut down the sugar, start to think about using it in chutneys and salsas or as an addition to salads. 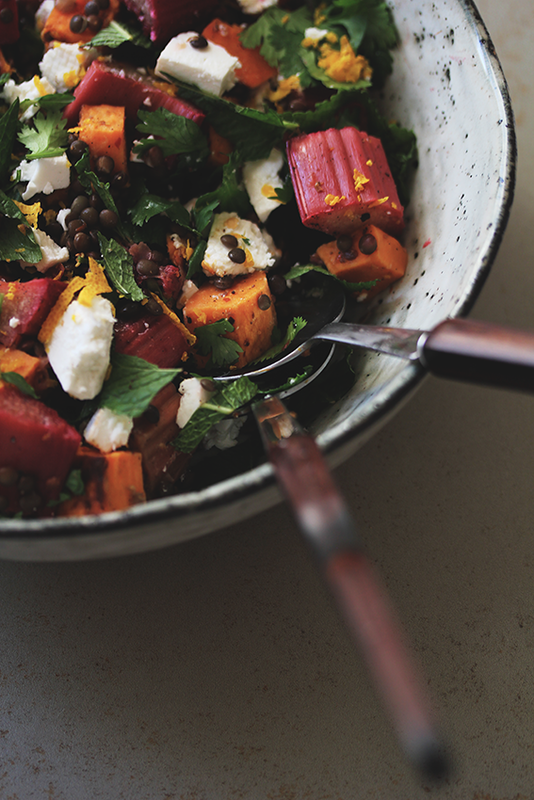 It makes an especially great accompaniment to hearty dishes like grilled meat or to substantial salads like this lentil and sweet potato combination. Which is why this salad is perfect for your next barbecue! It is a crowd pleaser, filling enough for any vegetarian friends, it can sustain some time in the sun and makes a great leftover (although I doubt, that there will be anything left). The recipe makes a really BIG bowl of salad. If you plan to make it for a normal dinner, you might want to half the measurements. It also keeps well in the fridge and can feed you the next days. If possible, start by soaking your lentils, preferably overnight, in an acidic medium (water with apple cider vinegar, kefir or yoghurt – read more about it here). On the next day, preheat the oven to 200°C. Wash the lentils and then cook them for about 20 minutes. They should be cooked through but still have some crunch and shouldn’t start losing their shape. Drain them and place them in a large bowl. Immediately drizzle them with olive oil and apple cider vinegar, add 1 tsp of salt (or more to taste, but remember that the feta is salty) and the chill flakes. While you cook the lentils, peel and dice the sweet potato. Roast the coriander seeds in a skillet without oil and then ground them together with the cardamom seeds with a mortar and pestle. Melt 1 tbsp of coconut oil. Place sweet potato on a baking tray and mix with spices, 1 tsp of salt and oil until the are covered with the mixture. Place in the oven and roast for about 20 minutes or until soft. Meanwhile, wash the rhubarb and slice it (2x3cm should be fine, if the pieces are too small, the rhubarb might disintegrate while it’s in the oven). Wash the orange and carefully zest it. Add the zest to the cooked and drained lentils, but set a little aside for decoration. Place the rhubarb in an ovenproof dish. Juice one half of the orange and drizzle the rhubarb with it. Add granulated stevia (or other sweetener) and vanilla. Make sure the rhubarb is covered with the mixture. Take out the sweet potato, lower the heat to 160°C and place the rhubarb in the oven for 15-20 minutes, until it’s become slightly soft, but hasn’t started to disintegrate. Dice the feta and chop the herbs. Add everything to the lentils and mix carefully. Season to taste with salt, chili flakes, a little more orange juice and olive oil. Sprinkle with orange zest and serve. Note: The salad keeps well in the fridge especially if you add the feta and the herbs just before serving.